The other day, my mom asked me for a sympathy card. The husband of a friend of hers just passed away, after 59 years of marriage. I went looking on my Pinterest board of sympathy cards for design ideas, and found this one. The popped-up "frame" inspired me. I cut a piece of 140 lb. Canson XL watercolor paper to 5.5x4.25". 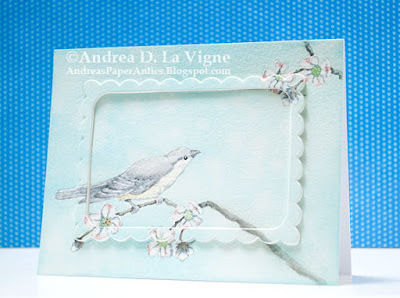 After planning out where my die cut "frame" would be, I used Hero Arts Soft Granite ink to stamp the "Bird" image from Our Daily Bread Designs towards the lower left corner. I felt the upper portion of the card was a bit bare, and I knew I wouldn't be adding a greeting. So I masked off the bird part of the stamp, inked up just the one grouping of flowers in Soft Granite, & stamped it in the upper right corner. I like the way it looks like the bird is looking at those flowers. The bird & flowers are kind of generic, so you can color them to be almost anything. It being spring here in Texas, I decided to color the bird like a mockingbird, & the flowers like dogwoods. So I used my Inktense pencils to do that, applying the color with a damp paintbrush, and using photos I got via Google as a coloring guide. I didn't like the way the branch just kind of ended at the right side, though. I suppose the stamp was designed to be used on a smaller panel. So I just picked up color from the pencil I used for the branch & painted on an extension. I don't know if it's technically "correct" from an arboreal standpoint, but I prefer the way it fills the space anyway. After I colored the bird & flowers, I stamped the image onto a piece of masking paper, and again (just for the flowers) on a full-sticky Post It note. (I laminated the larger mask with packing tape before cutting it out, and am keeping it with that stamp. The flower mask I didn't need again, so I just recycled it.) I cut out my masks, and masked off the images on my panel. I left the branch unmasked, since I figured it was dark enough to stand on its own when I inked. Then I inked the background with Tumbled Glass Distress ink and a foam blending tool. After I removed my masks, I spritzed the panel with water droplets from a Distress Sprayer, let that sit for several seconds, and then blotted up the water with a paper towel. Since the Inktense color is (basically) permanent when dry, the towel only picked up color from the background. I let the background dry, then taped one of the "Frame in Frame" dies from Taylored Expressions centered on the panel. I ran that through my die cutting machine. I also die cut the frame from white craft foam, and used Perfect Paper Adhesive to glue the watercolor frame to that. Then all that was left was to adhere all 3 pieces to a white A2 card base. Our Daily Bread Designs "Anything Goes with ODBD Stamps"
Simon Says Stamp's Monday Challenge: "Things with Wings"
I really do like this, it is never easy to make cards for this occasion but you have done it perfectly. Andrea, congratulations for this awesome card being recognized as the ODBD Customer Card of the Day! The bird image is so beautiful and extension of the branch is creative! Great artwork, Andrea! !